SYDNEY, AUSTRALIA Smartphone sales experienced strong growth in 2017 driven by an Android replacement cycle, according to a new study by emerging technology analyst firm Telsyte. 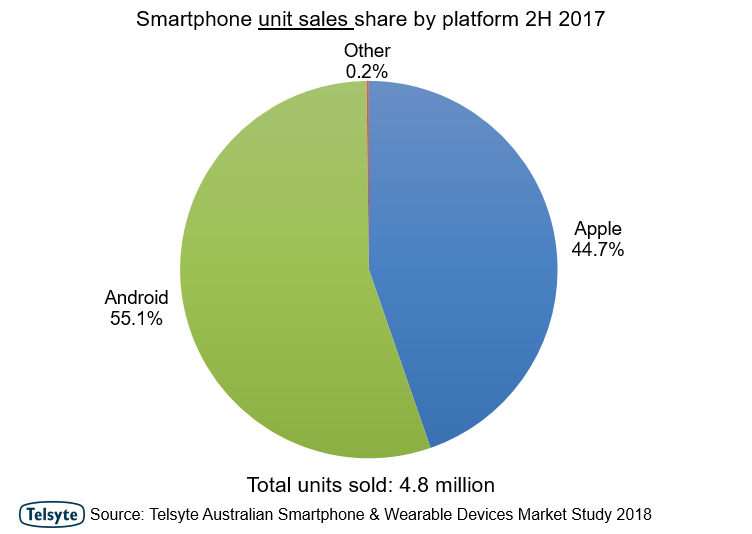 The Telsyte Australian Smartphone and Wearable Devices Market Study 2018 found overall year-on-year smartphone sales were up 11 per cent with 9.2 million units sold. Telsyte estimates 4.8 million smartphones were sold in the second half of 2017, up 6 per cent from 2H 2016. Android devices made up 55 per cent of all units sold, mainly due to 2017 being a “replacement year” for Android users. There are now some 19.3 million smartphone users in Australia, with 8.6 million using iPhones and 10.3 million on Android (about 0.4 million use other platforms). The top three Android vendors in H2 2017 were Samsung, OPPO and Huawei. Despite a predicted upturn in Apple sales due to the iPhone X (pronounced “iPhone ten”), a significant number of additional sales were not recorded in Australia, mostly due to the high price tag and short time-in-market during the calendar year. Overall, the iPhone 8, 8 Plus, and 7 were the most popular iPhone models in 2H 2017. Telsyte estimates the average cost of a smartphone in Australia has risen by more than 30 per cent since 2015. One reason for this rise is Australian smartphone users are now seeking models that have more internal storage, which generally cost more. Internal storage is now ranked the fourth most important feature when choosing a smartphone, up from sixth in 2016. Over 70 per cent of smartphone users claim internal smartphone storage is an important factor in their purchasing criteria. Due to higher investments in smartphones, the average replacement cycle for devices is now closer to three years than the previous two years. Additionally, 44 per cent of smartphone users say the number one reason for not buying a new device is that their smartphone is “still in good condition”. Despite iPhone sales remaining steady to H2 2017, Apple maintained the highest repeat purchase rate of any brand. Amongst those that use an iPhone and had purchased a replacement smartphone in 2H 2017, around 85 per cent chose to purchase another iPhone. The next highest was Samsung, with more than a 70 per cent repeat purchase rate. The smartphone operating system is the fifth most important factor to people when choosing a smartphone (up from tenth in 2016), with three quarters of both iPhone and Android smartphone users finding this important. “As the smartphone market has matured, platform loyalty is at an all-time high, creating almost two unique marketplaces,” Telsyte Managing Director, Foad Fadaghi says. Sales of smartwatches exceeded smart wristbands for the first time in Australia (58 per cent smartwatch vs. 42 per cent smart wristbands), with 844,000 smart wrist wearable devices sold in 2H 2017. Overall there was a year-on-year decline in smart wrist wearables dragged down by plummeting fitness band sales, which declined by over 30 per cent. Conversely, six-month sales of smartwatches grew 29 per cent (compared to 2H 2016), as health and fitness features on smartwatches cannibalise less capable wrist bands. Almost three quarters of smartwatches sold during 2H 2017 were Apple Watches (360,000), compared to just over half a year ago. Telsyte research shows annual unit sales of Apple Watches have been consistently outselling Swiss watches in Australia since 2016. However, Swiss watch revenues are higher as they often cost more and deliver higher margins for watch retailers(1). LTE or mobile network connectivity is igniting interest in the smartwatch category. Telsyte research shows almost 30 per cent of Australians are now showing interest in smartwatches that have built-in mobile connectivity. The percentage increases to 51 per cent amongst existing smartwatch users. Telsyte believes the new Apple Watch LTE (able to connect to mobile networks) version and lower entry prices on other models were the main drivers for the surge in Apple Watch sales during 2H 2017. Telsyte believes Apple exceeded 1 million Watch users in late 2017. Apple and Fitbit are still the market leaders in smartwatch and fitness bands market respectively at the end of 2017. Telsyte research shows one in seven (14 per cent) have completed a mobile contactless payment transaction at a payment terminal in store at least once, an increase from 8 per cent in 2016. The increasing adoption in mobile contactless payments is starting to influence Australian’s banking decisions. Telsyte research indicates Apple Pay has the most potential to change Australians’ banking decisions as Android Pay is more widely supported by major banks in Australia. “More than half of Apple Watch users in Australia cannot use Apple Pay with their primary bank, creating a climate for ,” says Telsyte senior analyst Alvin Lee. Around one in five (22 per cent) iPhone users claim they are more likely to bank with a provider if it supports Apple Pay. This figure increases to 32 per cent for those who are also using an Apple Watch. Telsyte measures smart wearable devices in the Telsyte Australian Smartphone & Wearable Devices Market Study 2018 as computing accessories worn on a user’s wrist typically paired and controlled via a smartphone. Examples includes products from Adidas, Apple, Asus, Fitbit, Garmin, Huawei, Jawbone, LG, Microsoft, Motorola, Nike, Pebble, Samsung, Sony, TomTom and others.